About "NLT Slimline Center Column Reference Brown/Tan (Red Letter Edition)"
You're holding the Holy Bible, New Living Translation. 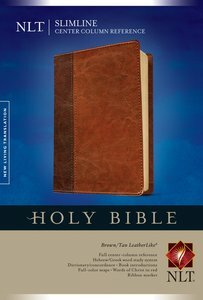 An authoritative Bible translation, rendered faithfully into today's English from the ancient texts by 90 leading Bible scholars. The NLT's scholarship and clarity breathe life into even the most difficult-to-understand Bible passages-but even more powerful are stories of how people's lives are changing as the words speak directly to their hearts. That's why we call it "The Truth Made Clear." Now available with full center-column reference, this slimline Bible features a portable size and quality construction for today?s on-the-go lifestyle. Classic reference features include a dictionary/concordance, end-of-Bible helps, full-color maps, a ribbon marker, and gilded edges.